Someone asked me the other day “What was your favourite ‘fast food’ when you were growing up”? “We didn’t have fast food when I was growing up”, I informed him, “all the food was slow”!! “No, come on, seriously, where did you eat”? “It was a place called home”, I explained. “Mum cooked every day and when dad got home from work, we all sat down together at the dining room table. And if I didn’t like what was on my plate, I was allowed to sit there until I did like it”! By this time the lad was laughing so hard I was afraid he was going to suffer serious internal damage, so I didn’t tell him the part about how I had to have permission to leave the table. Some parents NEVER owned their own house, never wore jeans, never set foot on a golf course, travelled out of the country or had a credit card. My parents never drove me to school, I had a bicycle that weighed about 50 pounds and it only had one speed, slow. We didn’t have television in our house until I was 10, It was of course black and white, and the station went off air at 11pm, after playing the national anthem and epilogue. It came back on air at about 10am next morning after showing the test pattern for about an hour and there was usually a locally produced show featuring local people and products. Pizzas were not delivered to our home but milk was. All newspapers were delivered by boys and all boys delivered newspapers. My brother delivered a newspaper 7 days a week. He got up at 6am every morning. Film stars kissed with their mouths shut, at least they did in the films. There was no movie ratings because all movies were produced for everyone to enjoy viewing, without profanities, violence or anything offensive. If you grew up in a generation before there was fast food, you may want to share some of these memories with your children or granchildren. How many do you remember? If you remembered all 20, you’re positively ancient! Don’t forget to pass this on! 14 Responses to Remember Some of These! I was just chatting with my parents last week about take away. They are in their 80s and 90s. The rare take away we did have was fish’n’chips. I even recall my brother and I spending our sixpence collection plate money for Sunday School (yep, he tought me how to avoid the nuns) on fish’n’chips on a Sunday . . .
Oops I remember them all and my Dad delivered bread from a horse and cart. His horse was called Maude. I’m in the truly ancient category; I remember all those things. I remember all that, but something I haven’t heard anyone mention. When the Television was switched off, there was a tiny, very bright light in the middle of the screen that took ages to fade out. I was fascinated by that. 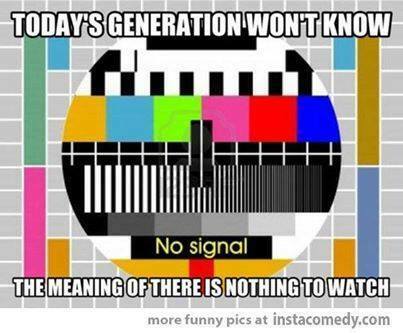 Maybe I’m older than Adam, but I remember TV closing after Children’s programmes. I think it came back on around 7.or 7.30 . My husband to be was telegram boy. And I’m fairly sure that the lady at the telephone exchange listened in on our phone calls when we were first ‘going out’ – that I made to Adelaide from that far distant town of Tailem Bend!!! when I first started working. I remember 19/20, though had forgotten most until you reminded me. And I really didn’t realize I was that old . .
And as for the test pattern – even Norm used to tell us to warm the set and cool the tinny. The telephone girls in Murray Bridge did listen in. Then they said “Three minutes, are you extending?”. You held your breath whilst there was a pause and then he said “yes”. Yep…after reading your entire “list”, I’m like you, Bob. That is, ‘ancient’. Such is life, whilst learning and managing the many ‘corporate changes’ experienced by me (and many others of similar ‘ancient’ status). Sadly, Gen Y’s seem disinterested about ‘ancient’ person’s life journey. But, for me, those ‘slow days’ will always be the best parts of my life. Ah yes very fond memories of all those plus many more like the rattle of the milkys bottles and the ice man and his horse ,those childhood memories will never fade. i remember about 15 of them but one I remember was when we had to leave the milk money on our doorstep for the milky and hope it wouldn’t get pinched. 12. 12? I couldn’t be THAT old, could I? I was raised by my great aunt so all but #20 are familiar. You did forget 78’s though 🙂 I still remember that my Grandmother did not even have a telephone till around 1997.